Forex broker Fort Financial Services (FortFS) offers to all new traders chance to receive $15 as a no deposit bonus. These free money will help you to assess the quality of broker’s trading service on a real account without any risking of your own money. FortFS bonus money will be credited to your account balance after succesful passing the verification of personal data. Pay attention, that you may apply for these 15 dollars of free no deposit bonus not later than during 10 days from the date of your account registration at broker’s site. Important fact: this Fort Financial Services’s bonus is withdrawable. After completing the requirement about the volume of closed transactions on Fortfs no deposit bonus account the trader will be able to withdraw the sum of bonus and earned profit. How to register at Fort Financial Services? As I wrote earlier, this FortFS bonus is available only for new traders. If you already have a trading account or investment account at this broker, then you may claim another bonuses to your FortFS account. So, if you do not have an account yet, then go to the registration section and fill in the simple registration form. You should enter your name, e-mail, date of birth, phone number, password, select your country and phone password. 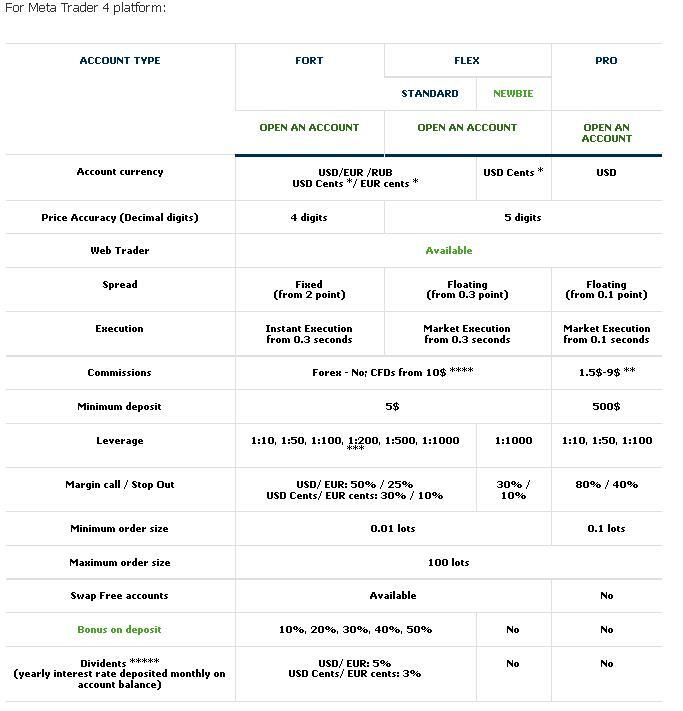 Select your preferred account type, currency and shoulder. Use generated passwords or create and enter new ones. You will need them to login the MetaTrader. On the next page you will see your account number, password and name of trading server. You have to save the screenshot of this page or save the information on a separate sheet of paper, it’s very important. From this page you can download the trading terminal, deposit money to your account (it’s not necessarily for receiving no deposit bonus from Fort Financial Services) or ask questions to the consultant. Then go to the account settings. You can specify when and how you want to be notified about the margin call and stop-out or participate in another bonus program (in this case, you have to deposit your account) or to cancel reports on e-mail. After completion of the registration, you need to verify your account. Only then you can claim the welcome bonus. So, login FortFS client area and go to “Account” -> “Verification”. As I said earlier, you have only 10 days from the date of registration for claiming the bonus. After 10 days – you can not get this bonus. Well, you need to request SMS to your phone number in the special field at verification page. The code from SMS you need to type in the form. I think that this part of the verification process you will pass quickly. Now go to the documents uploading. You need to scan or take a photo at least two of them: a passport (or international passport) and any document showing your actual address. Broker needs the scans of the registration page in the passport, a receipt of payment for utility services is not older than two months, the bank statement. After uploading your scans you need to wait for confirmation from the Fort Financial Services support. The process usually takes from 2 to 8 hours – keep this in mind, because you have only 10 days for receiving bonus. To check the status of verification process you may go to the “Bonuses” section -> “Welcome Bonus”. If the verification is passed ok, the “Get Bonus” button will appear there. Click on this button and your trading account will be automatically credited $15 or 1500 cents (or it can be the equivalent in rubles or euros). Do not forget, that you may get the Fortfs welcome bonus only once and only for one trading account. This offer is not available for your relatives who live at your address. How to withdraw no deposit bonus? This free $15 and trading profit can be withdrawn after completing the bonus requirements. For standard account your trading volume must be not less than 15 lot and for the cent account – 1500 lots. You can not use for execution of this condition the transactions at CFD market (stocks and ETF). You can deposit money to your bonus account for accelerating the completion of the requirement on trading volume. Your own money will not be blocked for withdrawal, you may withdraw them and trading profit from them at any time. Some words about methods for withdrawal from and deposit to FortFS. You may use for these operations Visa/Mastercard, Skrill, Neteller, Fasapay, Webmoney, Qiwi, PerfectMoney. One moment else. Fort Financial Services has the right to cancel the bonus and profit from it, if they will suspect fraud. According to the bonus rules you are restricted in possibility to hedge your positions and to open orders without any sense. In addition to this, a separate client is not entitled to receive a bonus on multiple trading accounts or on multiple registered logins. - In what currencies may I open the accounts? You may open Flex and Fort accounts in American dollars (USD), euros (EUR), rubles (RUB). - What types of account does broker have? 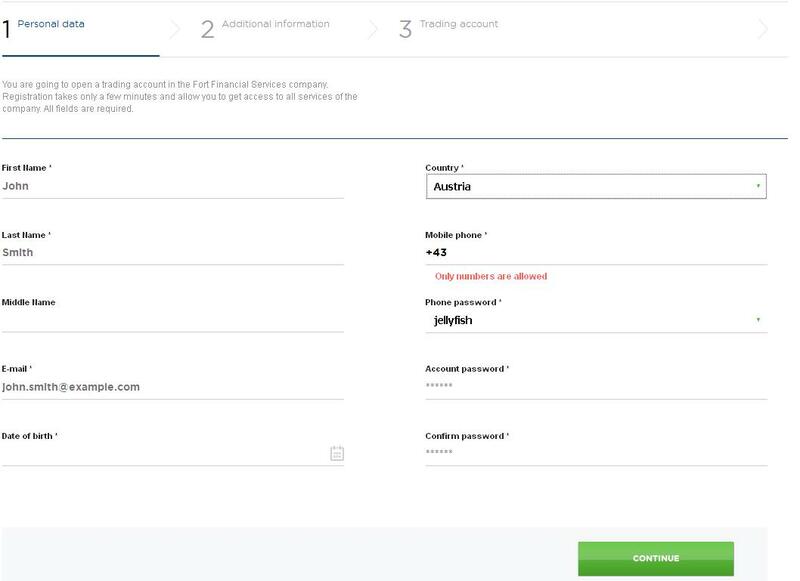 Fortfs offers three types of accounts: Fort, Flex and Pro, which may be opened in cents or in standard units. - Do they offer usual deposit bonuses? Yes, when you will fund your trading account you may get additional deposit bonus up to 50% of your deposit. - Is Fort Financial Services licensed by any authorities? Of course, the broker is licensed by the International Financial Services Commission of Belize with an international financial brokerage license, IFSC/60/256/TS/17, issued 15-APR-2013. - Which trading platform may I use with this broker? You may trade via Metatrader (MT4) or NinjaTrader. - What trading instruments does FortFS offer? Broker offers for trading next popular instruments: contracts for difference (CFDs), metals, options and futures contracts. Write a comment to "Fort Financial Services welcome bonus $15"